Battle of the Block Winner ? Next HOH/ Next BOB ? Amber and Brittany are making slop balls and other slop concoctions. lots of random chit chat..
10:45pm – 11pm Camera 3 &4 In the living room. Zach says that he gave his mom his ipad so that she could watch him on the live feeds. Zach leaves. Frankie asks Derrick how good it went earlier today. Derrick says so good. Victoria joins them and Frankie starts making faces. Victoria says she hope they get money tomorrow. She stops and says I mean the unitard. Caleb comes out of the diary room and says who wants to see my HOH room… Frankie asks really?! Caleb holds up the key on his neck and says no.. just kidding it’s the same one I’ve always had. They ask him if he gets his letter. Caleb says no, the next HOH gets that. They start playing a word guessing games. Frankie says he would rather Cody or Zach to win he’s worried Devin will win POV and go crazy again. Zach and Frankie are talking about final 2 and making up side alliance. It’s the standard divide and conquer. Frankie says he approached Christine already for a side alliance. Zach says he’s approached Derrick already “Me Cody, Derrick there will be the final 3 we’ll figure out a name that is my alliance.” Frankie is going to do the same thing with Christine and one other houseguest. 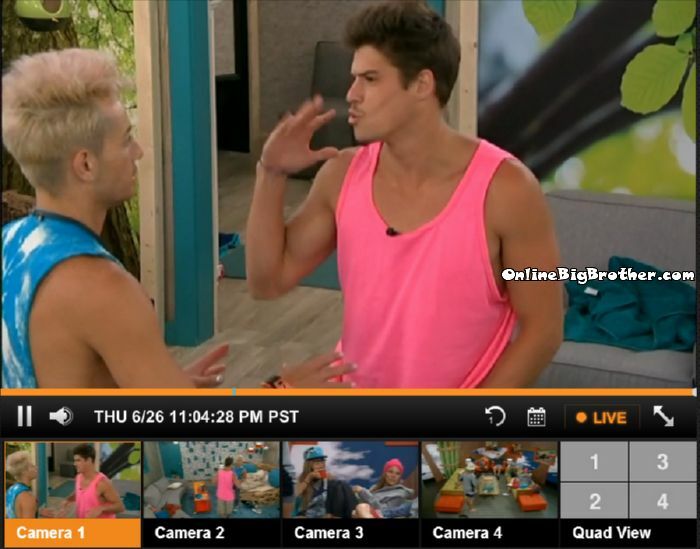 They both agree that Devin has “lost it.. Lost his mind” Zach and Frankie agree Cody hates Devin. Zach is certain Devin and Caleb are working together. Zach says Nicole and Christine are very close. Random chit chat.. Amber joins them they start talking about how much they miss loved ones back home. Amber misses her sister Christine misses her husband. Derrick rolls in with Brittany behind. Cody complains that the protein shakes are giving him gut pain. Hayden rolls in says he had two scoops and is feeling bad as well. Jocasta and Frankie join them.. just chit chat. 11pm – 11:30pm Camera 3 &4 In the living room. Paola, Amber, Caleb, Devin, Derrick and Joey are in the living room talking about random things. Caleb says that after 5 minutes in the havenot room he starts feeling it. He says that the havenots can use his HOH robe because he won’t use it. Amber talks about how much she misses her family. Devin is snoring on the couch. He wakes up and heads to bed. He asks was I knocked out? Derrick says yeah, you were snoring. Caleb says to Paola that Amber didn’t want to think we were in here for a showmance. Caleb says that everyone in here keeps asking him what’s up with you and Amber? Caleb says we’re both from the same place, we’re both 26 and have the same background. Caleb says that he really likes her. He says that he doesn’t want just a showmance. He would want it to be…. Paola asks would you move here for her? Caleb says I would move anywhere. Paoola says awe. Caleb says I am a real romantic person. I have tattoos and stuff but that’s just my shell. Paola says you’re like a book with a cover. Caleb says everyone thinks Amber and I have a thing. Derrick says you two are good friends and outside of here it might be different. Paola says maybe more to the middle. Caleb says that he hopes to call her up in the HOH room to just talk with her. He says just to tell her he likes her. I think you’re beautiful not just on the outside but on the inside and everything… Caleb says that Amber doesn’t want people to think we’re anything. He says that he just wants to talk with her and get to know her better outside of the house.I want to get to know you on that level. Caleb says Hayden and Nicole are obvious about liking each other. Caleb says that Amber told Frankie that she doesn’t like muscle guys but that he told her I wasn’t like that. Paola says that she wants to see it before she leaves. Caleb says that he doesn’t want to do it out in front of other people. Paola comments on how Caleb put her (Paola) on the block. Paola says just don’t tell Amber that you’ve been in fights, she doesn’t like that. Caleb says yeah I know that. 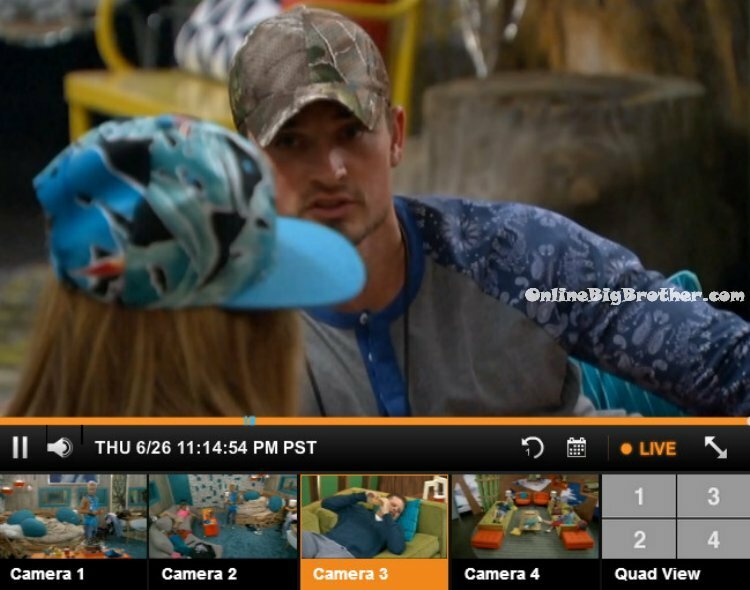 Caleb says that he catches Amber looking at him. She is always sitting next to me. Paola says that Amber is one of the people she is closest to in the house and see that she likes him. Caleb says that she is the first person he’s meet in the last 4 years that he would actually take home to meet his parents. More chit chat going on. Hayden rubbing Nicoles hair. We’ve heard other house guests comment on these two getting close. Caleb’s obsession with Amber is vomit inducing. He doesn’t just talk like the usual showmance people, he sounds like a creeper. Derrick deserves at least a beer for listening to all his crap and playing along. FIVE DAYS??? Didn’t this thing started last Wednesday? Today is Friday, why 5 days?? They always know each other much longer than the show is on. they meet before the final 16 are solid, while sequestered for like a week prior to entering the house i think, and when they enter the house, by the time wednesday rolls around they’ve been together about a week. we just see taping of the entry that is done days earlier. That’s why they have so many random clips by the 2nd show, they can’t have all those clips and all that carrying on when people know each other for 5 hours. still, way too soon for him to be obsessed. It’s like he is very insecure or desperate or something – not to mention OBSESSIVE. STOP. i know! what is wrong with this guy?!? who loves someone they met 5 minutes ago. and what happened to the game (remember it’s called Big Brother)? RED FLAG. poor amber, RUN. Caleb is weird to me, I can’t really explain it though. Weird vibes. Yeah. Caleb is something else. He’s falling way too hard, way too fast. 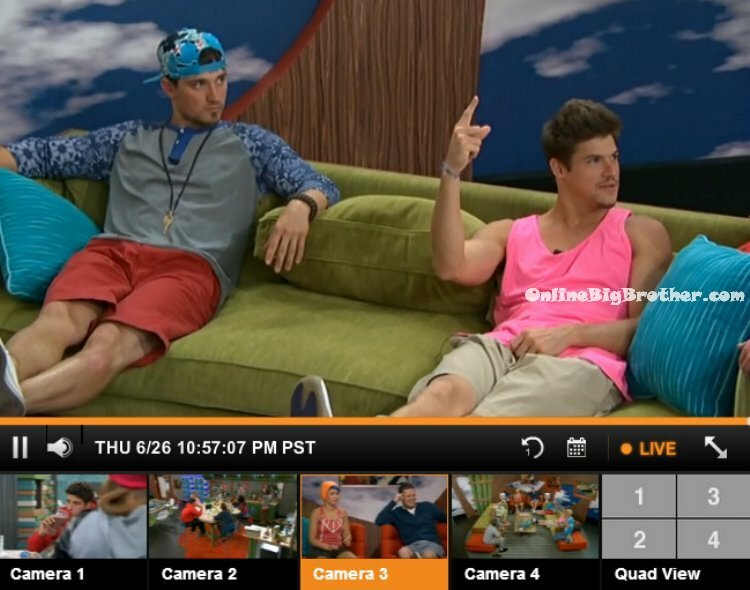 Zach openly admits he is a con artist… not sure if he is really into Frankie or if he is just conning him…. thoughts? I like these new twist it keeps Big Brother even more interesting the past seasons were starting to become the same thing and people were fighting the system to well! just my opinion. Totally agree on this. Everything was getting far too predictable and the producers & WE FANS needed a fresh start with new strategizing.